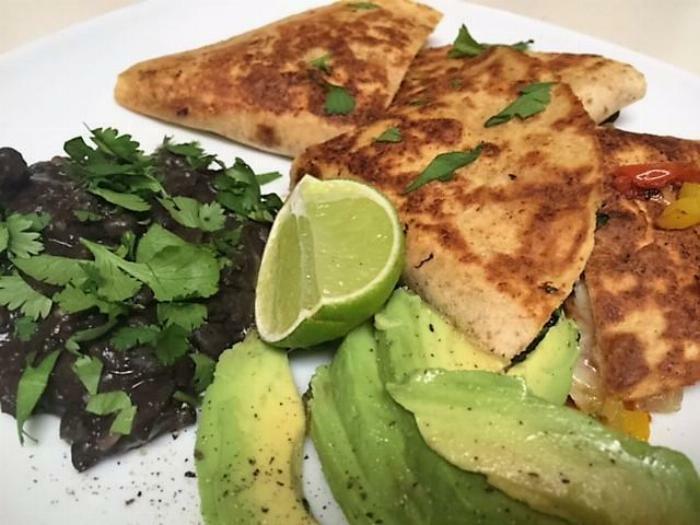 There is such a thing as a healthy quesadilla. The vegetables I used can easily be substituted for your favorites or whatever you happen to have in your fridge! 1In a large non-stick or cast iron skillet, heat 1/2 tablespoon of olive oil over medium-high heat. 2Add onion, bell pepper, poblano pepper, and zucchini. Season with a pinch of sea salt and freshly ground black pepper. 3Cook 5-6 minutes until vegetables start to soften. 4Remove vegetables from pan and set aside. 5Add another 1/2 tablespoon of olive oil to the pan. 6While it heats, set up your quesadillas. 7On one half of each tortilla, divide the cheese, chicken, sauteed vegetables, watercress and half of the cilantro. 8Fold in half and place carefully in hot skillet. 9Use another heavy pan or pot to press down on the quesadillas in the skillet. 10Cook 3-4 minutes, until the under side is brown, then flip each quesadilla. 11Cook another 3-4 minutes until both sides are brown and the cheese is melted. 12Slice each quesadilla in half and top with avocado slices.